SEO for company in a competitive industry is tough. 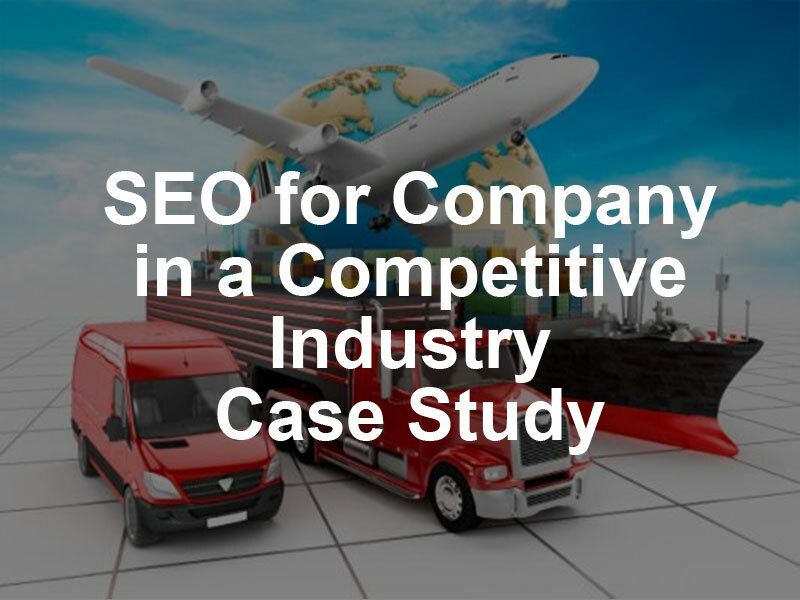 In this case study, we focus on one of our current SMB clients in the competitive transportation industry and how we got them on the first page of Google (with relevant, high valued keywords ) with thousands of views per month using SEO within 4 months. Being in the transportation industry is tough nowadays. Public transport, shuttles, taxis and global juggernaut Uber all compete for the same clients, making this a very crowded landscape to operate in. However, even in a crowded industry there exists many opportunities to attract new customers and increase bottom lines. Australia Five Star Limousine (or 5 Star Limo as it’s better known) offers limousine and luxury car hire for a number of services including door to door services, school formals, weddings, funerals and airport transfers. The problem with 5 Star Limo is their relatively late entry into the online digital market so even though they are not a small company, they had to play catch up to existing competitors. When 5 Star Limo approached ShoutItOut with their problems, we sat down with the company’s five directors to thoroughly discuss its company objectives and future plans. Their objective was to get on the first page of Google and be found by their customers to increase profits. Yes, it is quite a vague marketing objective but like many businesses starting out, the bottom line and online presence are perhaps two of the most important factors. Prior to this, budget constraints and not understanding how online marketing works meant their most important deciding factor on choosing a marketing partner was price so it’s no wonder that even after many months, there were little results to show for it. After working with SEO companies and getting little to no results, we understood their frustration. 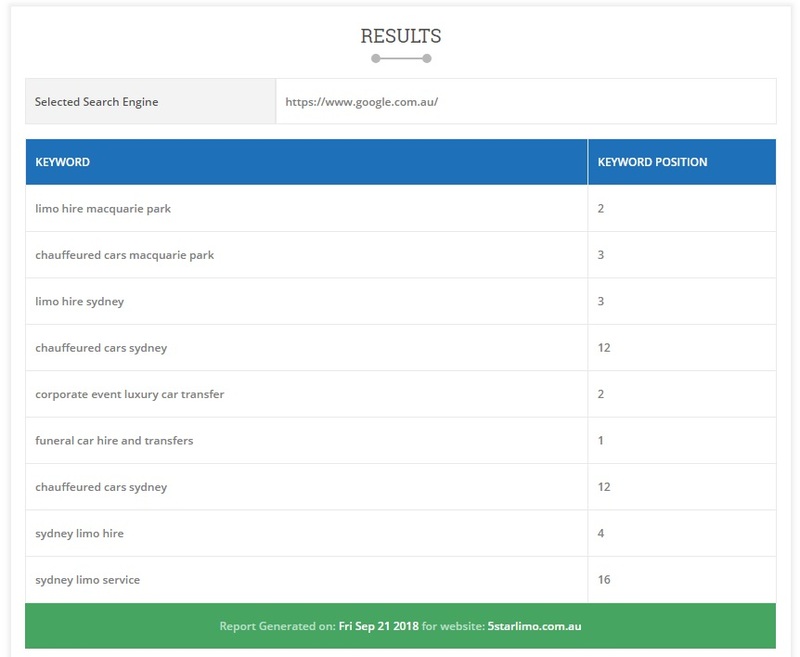 An incorrect understanding of what clients searched for meant keyword terms such as ‘luxury car hire’ were not targeting what its primary customers were looking for which is ‘luxury car with driver’ or ‘chauffeured cars’ or limos. Many pages were keyword stuffed with the word ‘limo’ which is spammy and makes them compete against each other. A shotgun approach meant they are competing with large, existing competitors. With their limited budget you can see they are not getting the results they desire. Efforts were put into ranking for keywords that had little or no searches per month. Many pages were filled with thin content. While the content on some pages were good, it was not written in a way that could attract people searching on search engines due to it not keyword targetted. 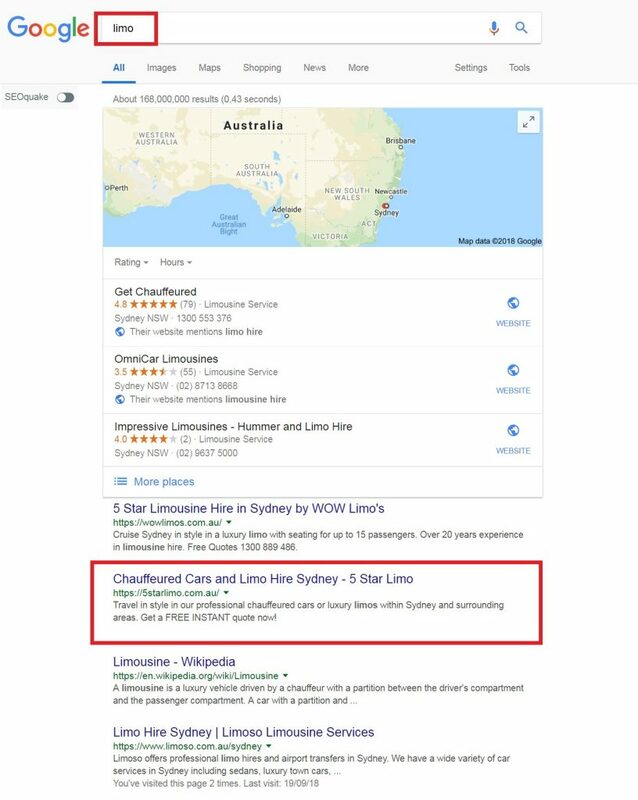 Their previous SEO company had them ranking on page 7 or more on their core keywords ‘Sydney limo hire’ and ‘Sydney limo service’ after six months so you can imagine their frustration. For SEO for Company in a Competitive Industry, you really need to look at all aspects of the puzzle because like other industries, nothing comes easy and every marketing decision needs to have a reason behind it especially more so if you are on a limited budget which most small to medium sized businesses are. We knew SEO was going to be their core strategy going forward but in the interim while SEO is taking time to work its magic, we used Google Ads to give them an immediate boost to their sales and limo bookings. In their PPC campaign we were able to get them huge amounts of traffic and business for lower than average cost per click but we will delve into it in another article and put our focus back into what’s being discussed, which is SEO and organic search engine ranking improvements..
After the initial analysis, the next step was to make sure their website was SEO optimised with the correct high traffic keyword terms. This meant researching and reevaluating their existing keyword and competition from the ground up, taking into consideration the competitor’s strategies, backlinks, keywords and search traffic. We provided 5 Star Limo with over 3000 keywords relating to their industry and services and from those 3000 keywords we discussed strategies to narrow down to the ones that are most searched and have relatively low competition to get the most out of their ROI. ShoutItOut then utilised over 100 white hat SEO techniques ( over the course of 4 months ) to propel 5 Star Limo into the top of the search engine with high traffic industry related keywords with thousands of unique visitors each month. 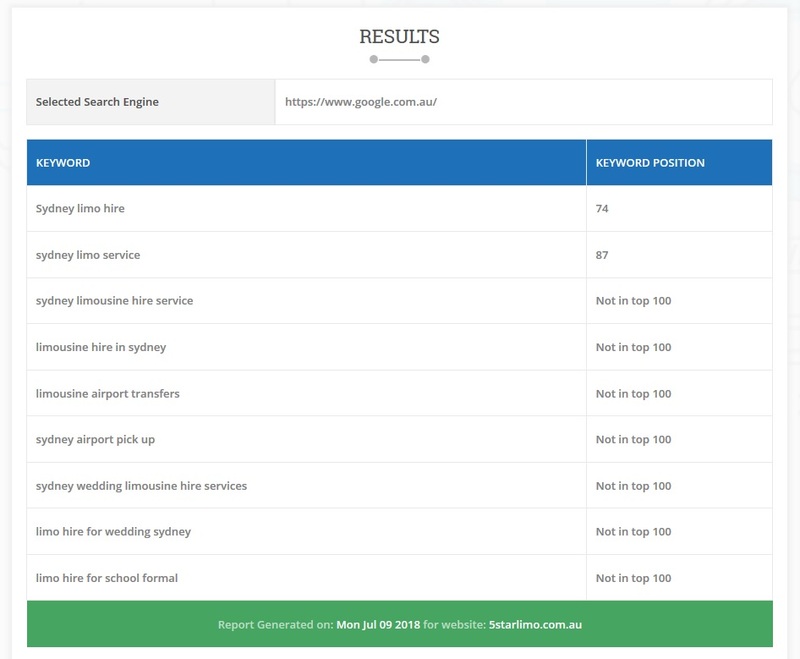 We were able to rank their most valuable term ‘limo’ and its related keywords such as ‘limo hire sydney’, ‘limo services’ etc… on the first page and in the top 5 positions in a short amount of time. Combined search volume of almost 10,000 searches per month with an average booking order of $150. 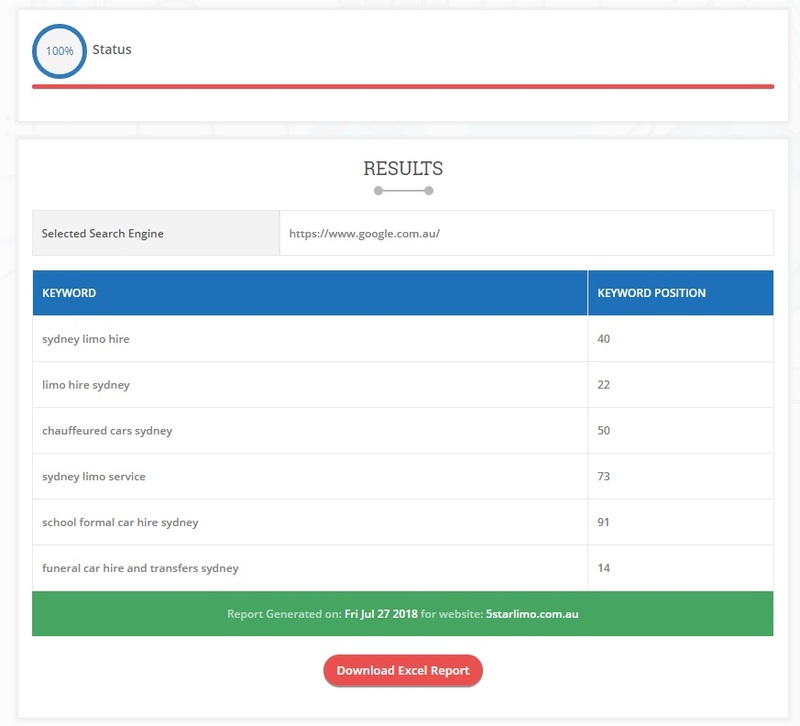 Over 3 thousand industry keywords and search terms were analysed and researched to see which ones provided value and captured the most visitors. Keywords were selected based on those criteria along with its competitiveness. Competitors within the same industry were analysed to determine their strategy and competitiveness and ways to beat them. On page and Off page SEO and website optimization were performed and over 100 optimization metrics were used to optimised website for search engines such as Google and Bing. Content marketing were used to attract new and returning visitors. Link building are essential in SEO and ShoutItOut was able to acquire high valued links to establish SEO and website authority. Google Ads helped the company get a large amount of bookings and leads within a very short time. Re-marketing was able to re-engage with clients who visited their website previously to improve conversion rates. We were able to gain traction on their SEO efforts in a small amount of time. From the first month to the third month, there are already drastic improvements in their core keyword rankings. Keep in mind that these keywords were derived from sound research and after our discussion with the 5 directors and it was agreed that each and every one of them brought in traffic and often lead to sales and bookings. One month after our SEO campaign, we can see movements among our chosen keywords. From before and after we took over, there were substantial movements from page 7 to page 2 and even page 1 for non competitive terms. Below are only the top ten keyword results. There are many more valuable terms and keywords that reached page 1 and page 2 which are not listed here. Compared to other traditional marketing services, SEO has one of the highest ROI. What’s more, SEO tend to last a long time. So the results, traffic and sales will keep coming long after your SEO campaign is finished. SEO campaign results can be seen long after the SEO campaign is finished. SEO is a very important, often critical aspect to every business today and should be viewed as a long term investment because while results may not be instantaneous it provides great long term benefits. As seen in the case study above, ShoutItOut provides a highly tailored and effective approach to our SEO service. Our long term commitment to our clients ensures we gain a complete understanding of a business before our work is commenced. This allows ShoutItOut a more thorough understanding of how it operates; focusing on its strengths to establish an SEO campaign that will successfully bring in new visitors and revenue time and again. SEO for Company in a Competitive Industry can be extremely difficult and time consuming even if you are experienced. We know your frustration. However, as seen in this case study, it doesn’t need to be and there are logical step by step ways to tackle such a problem – you just need to know how. If you want to replicate the same success 5 Star Limo, we would love to hear from you and offer our suggestions. Please contact us for more info.